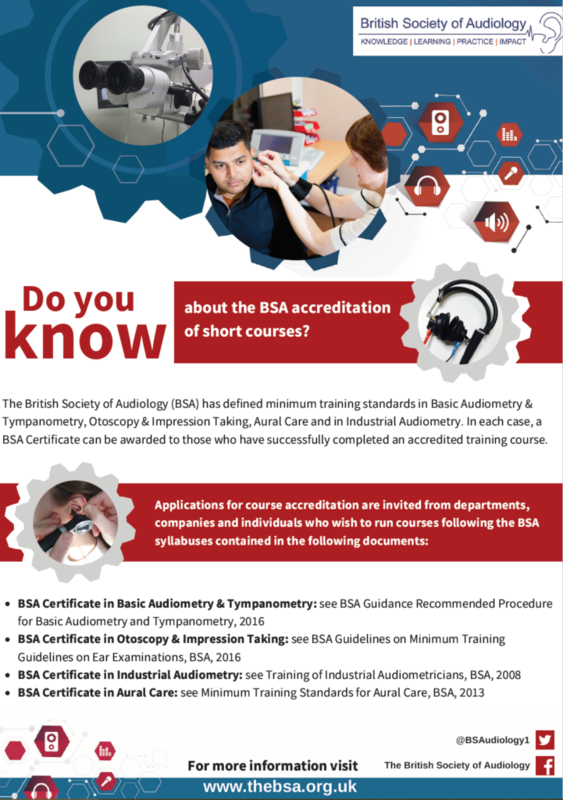 The British Society of Audiology (BSA) has defined minimum training standards in Basic Audiometry & Tympanometry, Otoscopy & Impression Taking, Aural Care and in Industrial Audiometry. In each case, a BSA Certificate can be awarded to those who have successfully completed an accredited training course. If you would like to find out more then please contact the BSA admin team on bsa@thebsa.org.uk or call 0118 9660622 to be put in contact with the Accreditation Team. The training course to which this certificate applies does not constitute an audiological qualification or part of one. The procedures taught as part of this course are undertaken at the risk of the certificate holder who is not an autonomous, audiology professional. Neither the trainer/s nor the assessor/s are responsible for the outcome of any practices carried out by the certificate holder using this training. Although care has been taken by the BSA in the accreditation of the programme for this training course, the BSA does not and cannot guarantee the interpretation and application of it by any third party. The BSA cannot be held responsible for any errors or omissions, and the BSA accepts no liability whatsoever for any loss or damage howsoever arising.